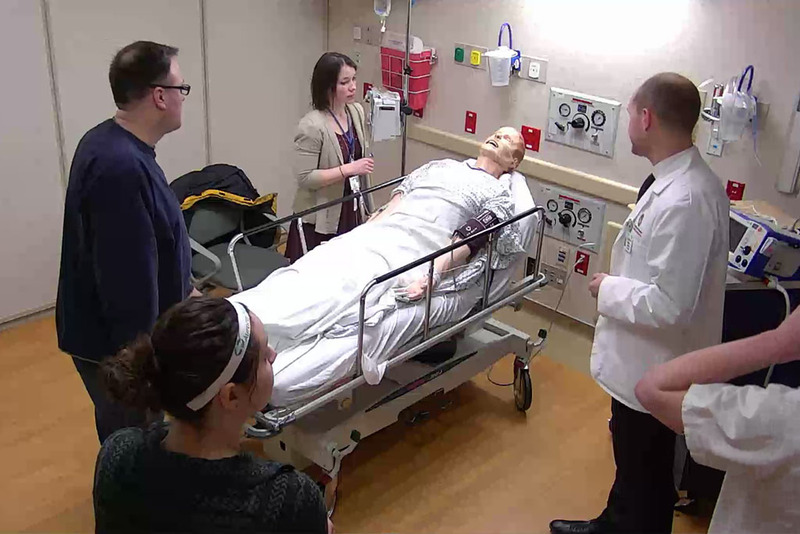 PharmD student Alex Wontor (right) with students from the School of Nursing and the School of Medicine in the UW Health Clinical Simulation Program. Standing outside of a hospital room, Alex Wontor listens to the commotion on the other side of the door, and waits. Inside, an elderly patient with pneumonia, who was just transferred from a long-term care facility, is having an allergic reaction to an antibiotic, and his son is growing increasingly agitated, to the point of yelling. When Wontor is called in, he’s not sure what he’s about to walk into, but he’s there to help. He finds two nursing students—one working directly with the patient, and the other soothing the concerns of his son—and a medical student, who needs Wontor’s confirmation that a different class of antibiotic won’t trigger the patient’s penicillin allergy. Because the patient was transferred with the wrong chart, his allergy wasn’t discovered until he started showing symptoms. It was all over within 15 minutes, and with the patient stabilized and his son calming down, the health sciences students leave to discuss what just happened. How did they know who to ask for what? What should they have done differently? 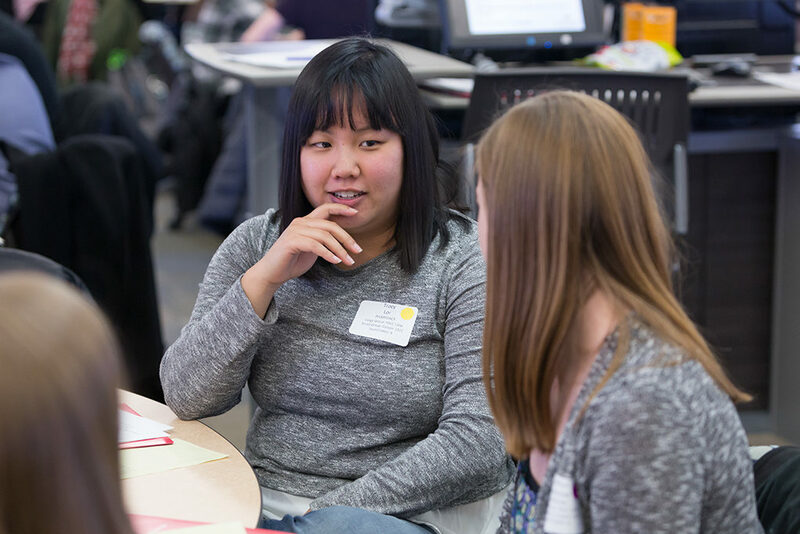 That’s what the students in that room, in the UW Health Clinical Simulation Program, were there to figure out—how to work effectively as an interprofessional health care team. “It was chaotic, but everyone did a great job with communicating and cooperating to take care of the patient,” says Wontor, a third-year PharmD student at the University of Wisconsin–Madison School of Pharmacy. The patient, in this case, was a high-fidelity mannequin, hooked up to monitors displaying “his” vitals in real time. The patient’s son was a standardized actor, there to test whether the students could think under the pressure of emotional distress. 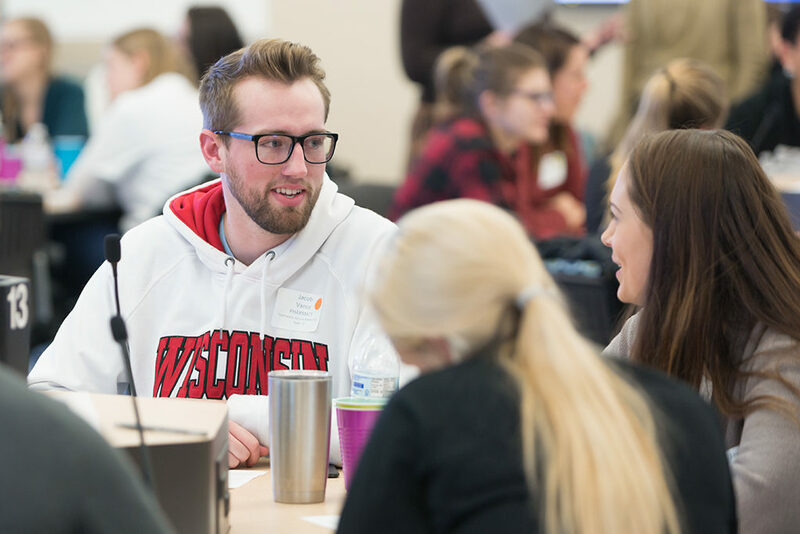 This simulation event was just one small piece of a large, concerted effort to introduce more longitudinal, evidence-based interprofessional learning experiences to PharmD students in the UW–Madison School of Pharmacy and across UW–Madison’s health sciences campus. The School’s interprofessional education (IPE) program was designed to ensure that student pharmacists enter their fourth year clinical rotations equipped with the attitudes, knowledge, and skills necessary to be an effective health care team member. 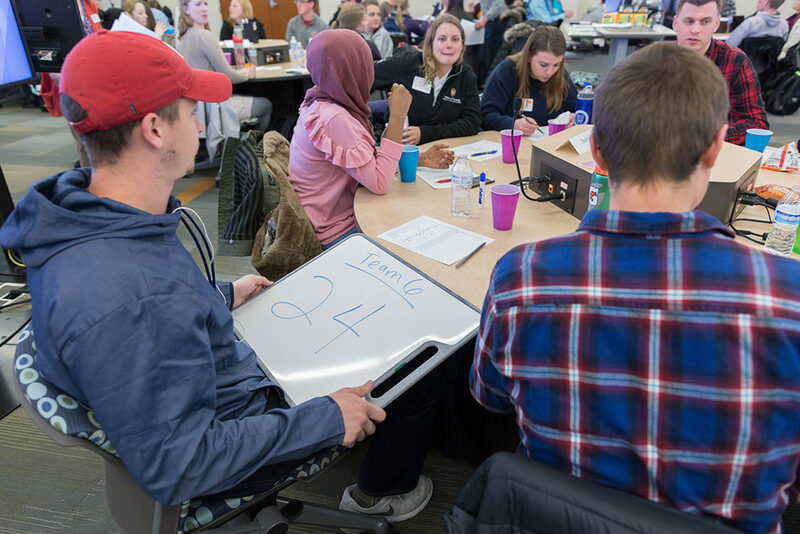 To foster team readiness and to help students understand their “dual identity” as both pharmacist and team member, opportunities for interprofessional socialization and learning will take place alongside students’ other training. “We are taking a very systematic, progressive approach to preparing our PharmD students for contemporary pharmacy practice roles, which involves imbuing them with a sense of who they need to be as a pharmacist as well as an interprofessional team member,” says Joe Zorek, pharmacy director of IPE and assistant professor in the Pharmacy Practice Division. 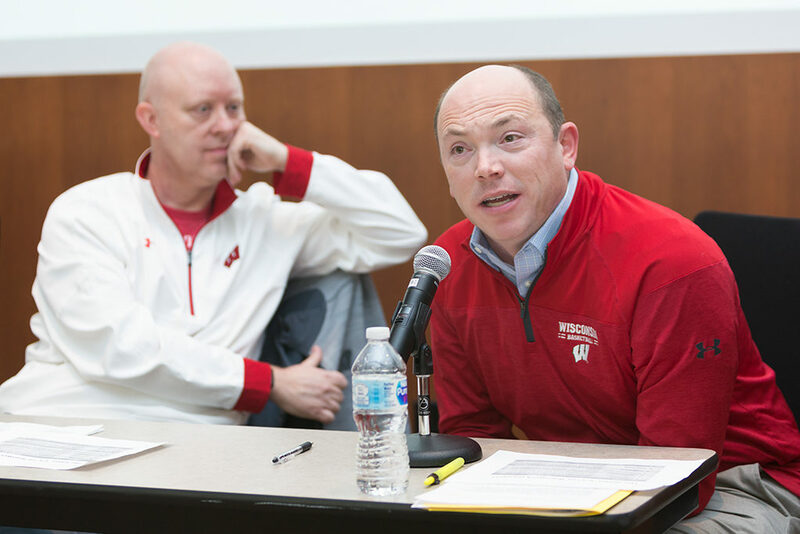 The push for IPE is a multifaceted effort, and the recently expanded constellation of learning opportunities currently offered to PharmD students at the UW–Madison School of Pharmacy and other UW–Madison health sciences students has been in the works for years. In 2015, the Accreditation Council for Pharmacy Education released upcoming new standards for public comment. Inside, there was a new standard dedicated exclusively to IPE. “Although the standards weren’t set to go into effect until July 2016, we immediately began to review our PharmD curriculum for its existing strengths and to put together the infrastructure necessary to enhance interprofessional education,” says Zorek. 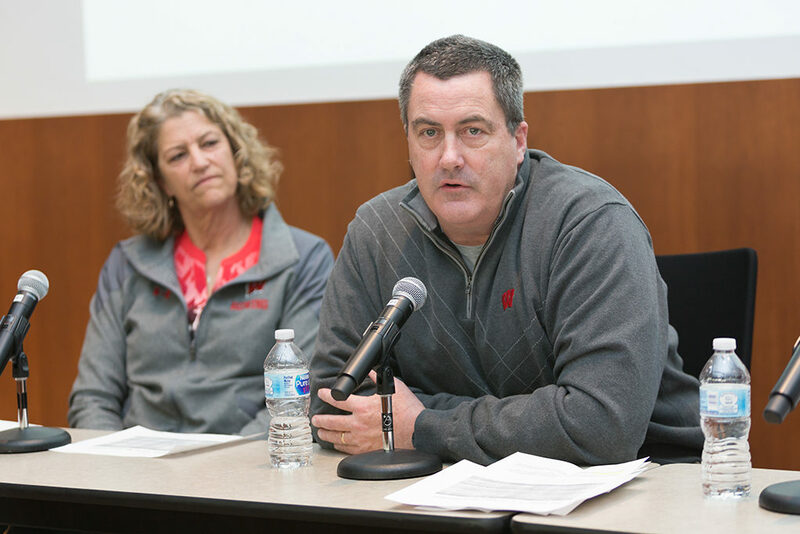 To kickstart that effort, School of Pharmacy Dean Steve Swanson created an IPE task force, which later became the School’s Interprofessional Education Committee, co-chaired by Zorek and Professor Mel de Villiers, associate dean of academic affairs. The review found a healthy number of optional IPE activities, such as elective courses with simulation or clinical components, the Interprofessional Health Council student organization, and the MEDiC clinic, a free, student-run clinic where pharmacy, nursing, medical, and other health care students work side by side with volunteers. The challenge facing the IPE task force was to figure out how to offer meaningful IPE to all student pharmacists, not just those who elect to do them. 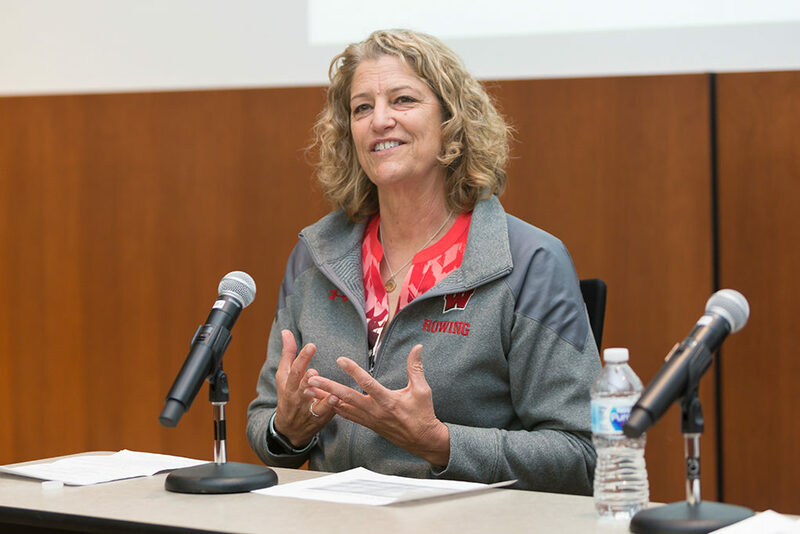 To help address this challenge, UW–Madison’s Health Sciences Council—chaired by the Provost and composed of the deans of the Schools of Pharmacy, Medicine and Public Health, Nursing, and Veterinary Medicine—created the UW Center for Interprofessional Practice and Education (CIPE) in 2016 and appointed Professor Jeanette Roberts, former dean of the School of Pharmacy, as its first director, working alongside Associate Director Roberta Rusch. CIPE is coordinating the development and implementation of four foundational IPE learning modules, which will complement other activities within the School’s IPE program. Four core competencies—teamwork, communication, values/ethics, and roles/responsibilities—outlined by the Interprofessional Education Collaborative, will serve as the basis for a series of learning modules CIPE is developing to get health sciences students learning, talking, and solving problems together. 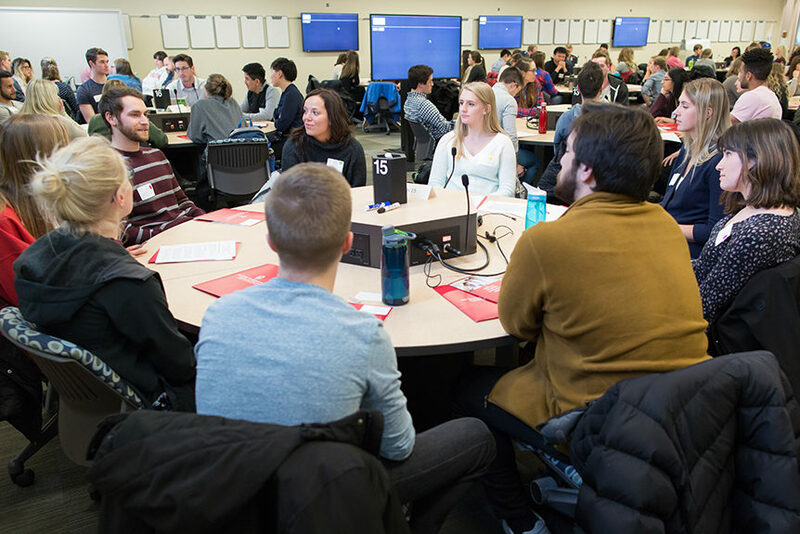 The series, dubbed the “Foundations of Interprofessional Teamwork,” will be spread across four semesters, starting with teamwork and communication modules for first-year students, then progressing to values/ethics and roles/responsibilities for second-years. The School of Pharmacy is planning to have PharmD students complete these modules alongside nursing and, when possible, medical and veterinary students. 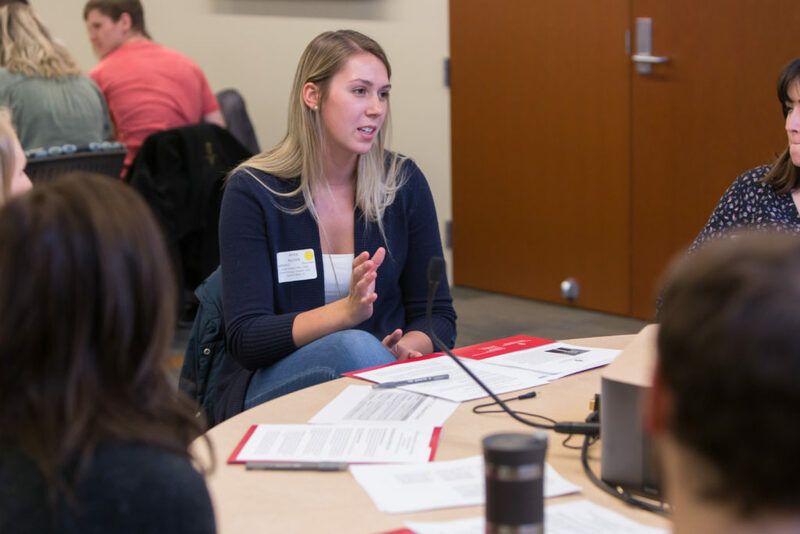 Faculty and staff with IPE experience from around the UW–Madison campus have been recruited by CIPE to contribute to the modules. 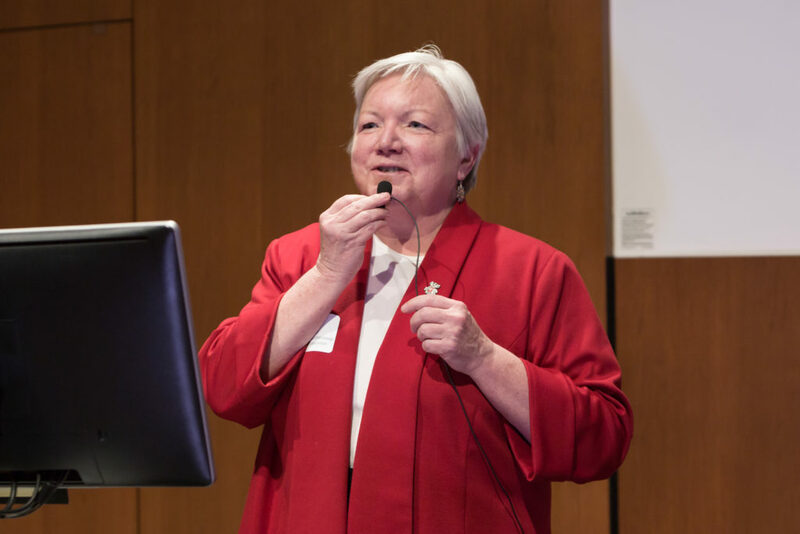 Ruthanne Chun, clinical professor and associate dean for clinical affairs at the School of Veterinary Medicine, is engaged in the effort and highlights the importance of this interprofessional collaboration. The teamwork module was piloted in spring 2018 with nearly 500 medical, nursing, and pharmacy students. 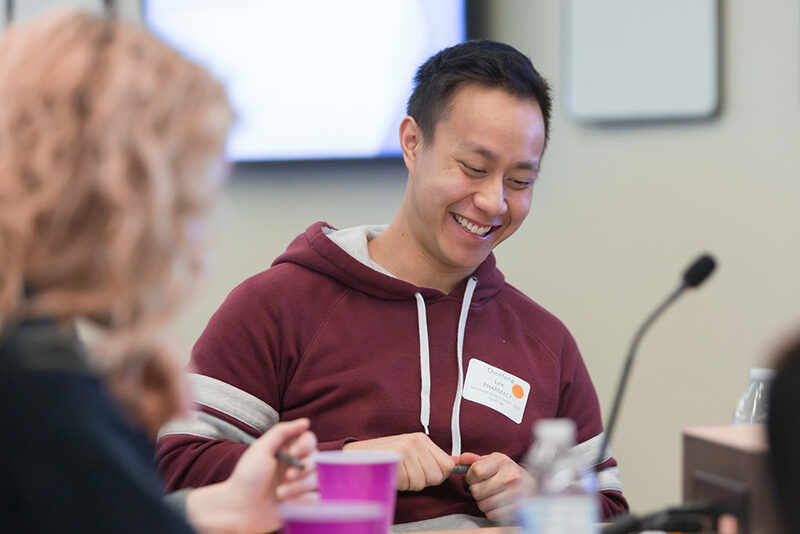 It consisted of two in-person sessions featuring hands-on collaboration, with an online component in between to facilitate further learning and conversation between health sciences students. 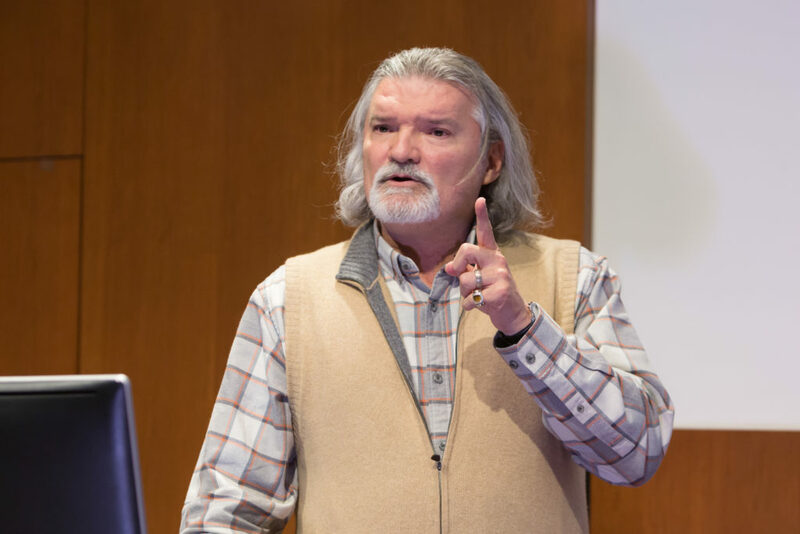 The first in-person session hosted speaker Eduardo Salas, a psychology professor at Rice University and internationally-recognized expert in team dynamics whose many research projects include astronaut selection and team training for NASA’s Mars mission. 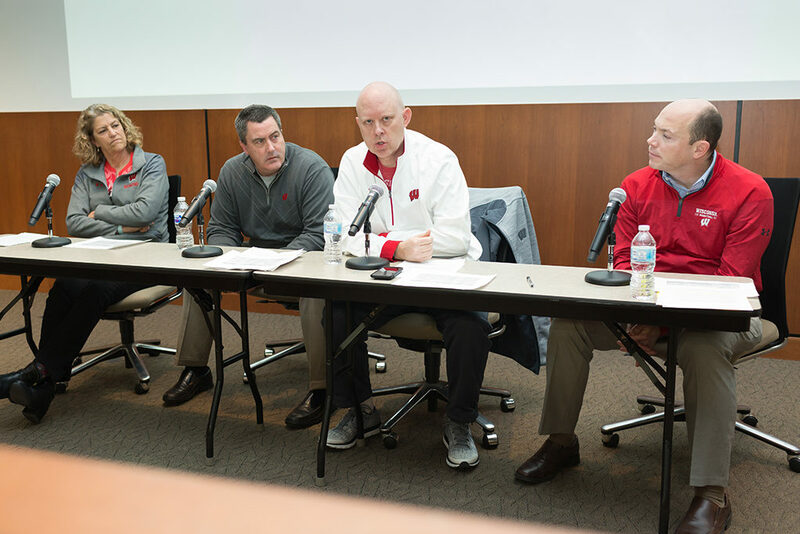 The second session brought in a panel of experts on teamwork—UW–Madison coaches, including football coach Paul Chryst and women’s basketball coach Jonathan Tsipis, who happens to hold a bachelor of science in pharmacy. Following each presentation, the health care students broke into interprofessional teams and were given tasks requiring collaboration and the application of teamwork principles taught by Salas and highlighted by the panel of coaches, with a focus on the seven Cs of teamwork—capability, cooperation, coordination, communication, cognition, coaching, and conditions. The simulation that Wontor and 43 other third-year PharmD students at the UW–Madison School of Pharmacy participated in is an interprofessional learning experience that Zorek hopes to expand to all third-year PharmD students in the coming years to prepare them even further for their fourth-year rotations during their Advanced Pharmacy Practice Experiences (APPE). During the simulation, faculty and instructors monitored the students’ reactions and could control the mannequin’s vital signs. 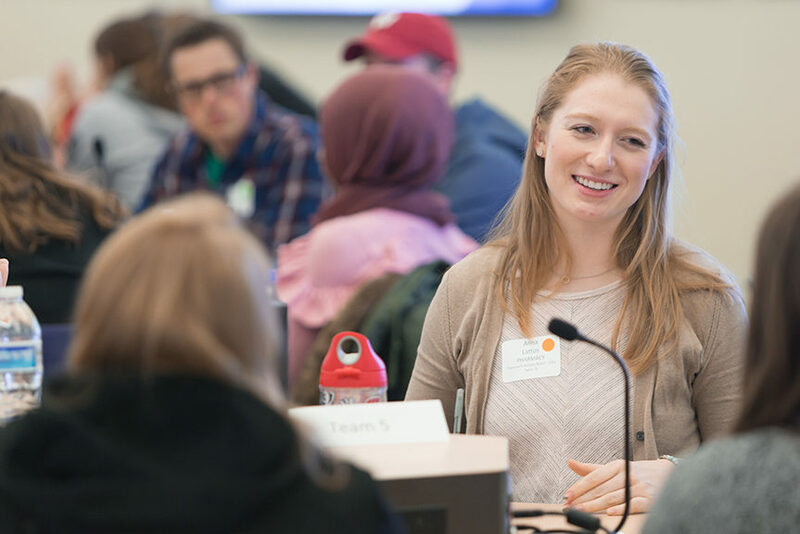 In the fall 2018 semester, in addition to the CIPE values/ethics module, second-year PharmD students will be working with first-year medical students for a clinical debriefing event. 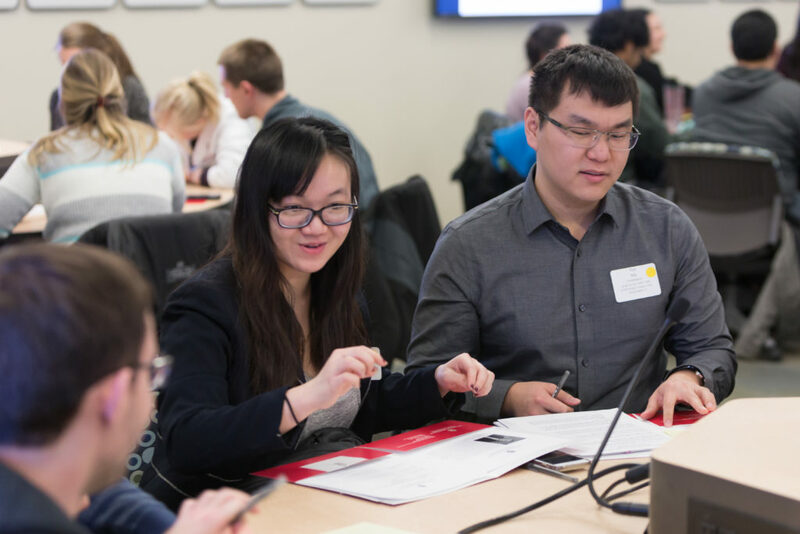 Additionally, third-year medical students will be joining third-year PharmD students for a medication safety activity during a course led by Michelle Chui, associate professor and vice chair of the Social and Administrative Sciences Division. Karen Kopacek, associate professor and associate dean of student and academic affairs; Beth Martin, associate professor and assistant dean for assessment, teaching and learning; and lecturer Kate Rotzenberg are also working to plan IPE activities that will be required for the School’s PharmD students. “We want to foster positive attitudes towards teamwork and the acquisition of knowledge and skills that will allow all PharmD students to succeed as integral members of the health team,” says Zorek. Learn about the School of Pharmacy’s PharmD program. Read more about the UW Center for Interprofessional Practice and Education.